Thanks to last weeks hint that Flea Infested Chimps may be unleashed among you, there were SEVEN great blogs recommended THANK YOU to the contributors. Today I will post four (4) for this weeks Blog Browser Day, (the other three will be aired next week in case everyone else gets a sudden attack of Lazybonesitis THIS week and I have to uncage the Chimps) – so give yourselves a treat this weekend and click on the blog names (and the recommenders names) to visit them. What The Hell is a daily (more or less) account of my foray into self-publishing. I’ve just released my second novel, Yesterday Road, and the blog has been my journal of the highs and lows, the obstacles, and the surprising rewards of the process. My blog offers unique, easy to read, and mostly fun perspectives on different aspects of life. Sometimes I’ll do book reviews, but more often, I put a spin on the mundane. My goal is to uplift and promote personal growth. This blog is run by a male and female who help bring authors and publishers together. They run contests, but that’s not all they do. They offer critiques, submissions to showcase your talents, and more! This entry was posted in Blog Browser Day and tagged Blog, blogging, General by The Story Reading Ape. Bookmark the permalink. I am what my name states, an ape of the primate species called Homo Sapiens Sapiens. My blog is intended to present New (to me) Authors, whose stories or books I have read and enjoyed, so that anyone who happens to stumble onto this blog, while searching for a book to read, or, a new (to them) author to try, may find what they seek, or, at least, inspiration. I have also made the blog an Author Promotions Enterprise to be a platform for authors to introduce themselves to potential readers and to provide advice and tips resources information they can use to improve and enhance their story telling efforts. Please be advised that I reserve the right to remove, or decline to publish, any comments that I deem inappropriate. 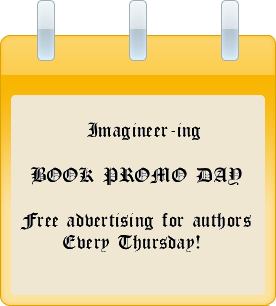 Grab The BOOK PROMO DAY Button! Parts of this site, particularly the content of posts and pages, and Imagineer specific images, are Copyright © Steve K Smy, 2012. All rights reserved. Imagineer-ing by Steve K Smy is licensed under a Creative Commons Attribution-NonCommercial-NoDerivs 3.0 Unported License.